Social media needs to play a role in your digital marketing strategy; you probably know that. What you may not realize is how LinkedIn can and should factor into your strategy. LinkedIn ended 2016 with over 467 million members, of which 40 million are decision makers. And, when it comes to reasons you should be using LinkedIn to grow your business, that’s just the tip of the iceberg. In this post, we’ll dive deeper into the reasons you should use LinkedIn and walk through the 4 steps to using LinkedIn to grow your business. Why Should LinkedIn be a Part of Your Social Media Strategy? Your digital marketing, and specifically your social media strategy needs to focus on meaningful engagement with customers and potential customers. People are so inundated with content that they often tune out irrelevant or purely promotional messages. That does not mean that they do not engage with brands online, quite the opposite. They simply focus their attention on brands that share useful and relevant information and content. 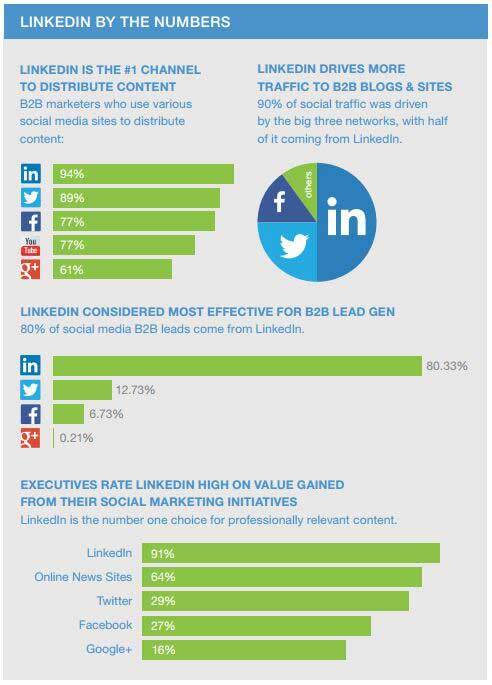 When companies post engaging content to LinkedIn, the results are often better than other social networks. Don’t take this data to mean that you should abandon other social media sites for LinkedIn, but rather that you should devote a certain portion of your social media marketing energy on LinkedIn as well. Step one may seem obvious, but the first thing that you need to do is to get your business on LinkedIn and do it in the right way. 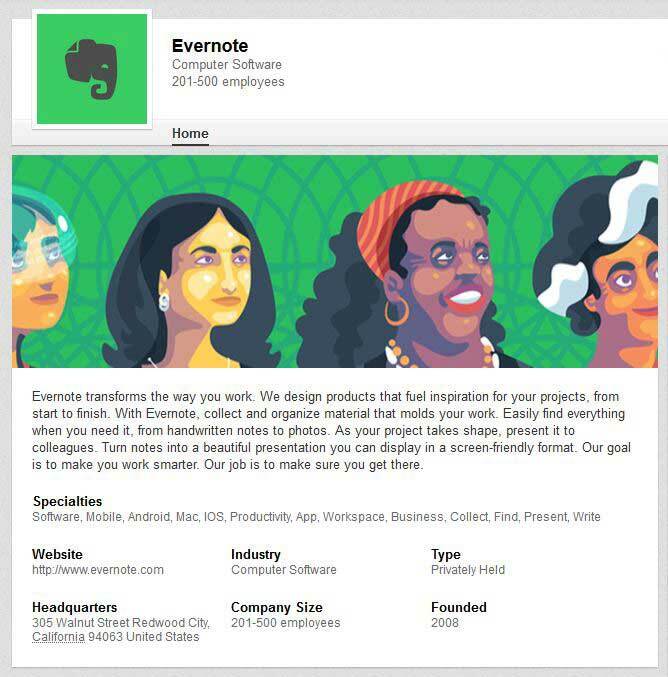 Evernote does a great job with their LinkedIn marketing, and it all starts with a well branded and cohesive profile page. A good profile begins with your branding. Make sure that your company has an icon or a logo variation that is suited well for use in social media. Beyond that, ensure that the imagery you use for your various featured images and posts is consistent with your brand. Finally, ensure that all your information is complete and accurate. This may sound trivial, but a great number of LinkedIn business profiles are missing key pieces of information, including contact information. The whole point of having social media in your marketing mix is to engage with your target audience where they spend time online. If you constantly post poor quality or “sales-y” updates, you will quickly become white noise and be relegated to the ranks of the scrolled through and ignored, or unfollowed altogether. Updates on LinkedIn are a great place to share pieces of content that you have created as part of your overall content marketing strategy. Content like eBooks, whitepapers, or webinars make great reasons for posting an update. Better yet, include a lead capturing call-to-action to an eBook in a related blog post and use that blog post as the basis for your update. Again, looking at Evernote as our example, you can see how an engaging updated created from a blog post can garner likes and even start a conversation. Groups are a great way for you to engage with your target audience on a peer level. LinkedIn groups are often a little more formal than what you might find on Facebook, but still casual in comparison to most business interactions. Participate in industry related groups and join in the discussions happening there for increased exposure and to establish yourself as an expert in your field. Answer questions, post group topics, and direct people back to your blog for related articles you have written whenever possible. Being a regular participant in group interactions on LinkedIn can be a time-consuming endeavor, but can yield fantastic results for your lead funnel. As you start building your organic presence on LinkedIn, you may consider investing in a range of paid opportunities to reach the right people and engage them at a scale not possible with your fledgling organic profile. 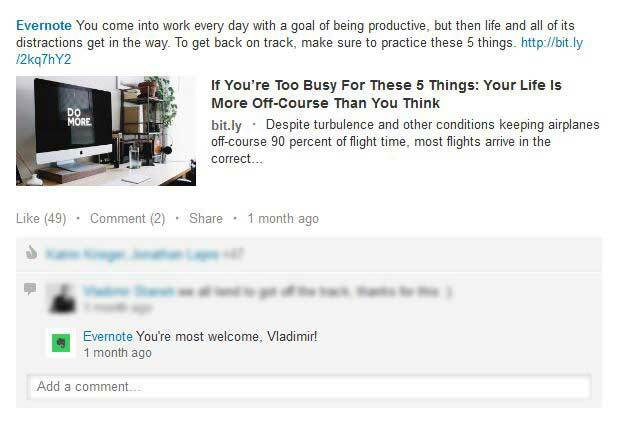 Sponsored Content: LinkedIn’s Sponsored Content allows you to pay to have your content delivered directly into a user’s LinkedIn feed, similar to how it would appear if they followed your brand. This in-feed ad allows you to grab a user’s attention where they’re most engaged. Sponsored Content is often our preferred method for advertising on LinkedIn. Sponsored InMail: Using InMail, you can send personalized messages right into a user’s LinkedIn inbox. While probably the most direct way to engage your target audience on LinkedIn, this may have the effect of feeling spammy, so proceed carefully or be prepared to annoy your target audience and waste your marketing dollars. Display Ads: These are your stock sidebar ads. They are generally, a lower price per impression, but that comes with a lower engagement rate. These may be helpful in getting you on the radar early and building your brand with the right audiences, but they don’t offer the engagement of Sponsored Content. Dynamic Ads: Dynamic ads are essentially “smart” ads that allow you to deliver custom content or creative to users based on data in their LinkedIn profile like company, skills, interests, and more. Additionally, images can be pulled from user’s profiles including their profile pic and used in your ads. The jury is still out on this one, though we will say that data supports the effectiveness of ad personalization. The marketing needs of most of our clients leads us to favor Sponsored Content as our most often used approach for advertising on LinkedIn. Every company has different needs, and if there is a budget for building an organic following on LinkedIn, dynamic ads may be the right solution to build your follower base. As with any social media strategy, creating, targeting, and optimizing your ad campaigns is an extremely time-consuming endeavor. If you have limited experience, time, or interest in using social media advertising on your own, we highly recommend working with a social media marketing company to ensure that your marketing dollars are well spent. In today’s digital heavy marketing environment, social media needs to be part of your marketing mix. 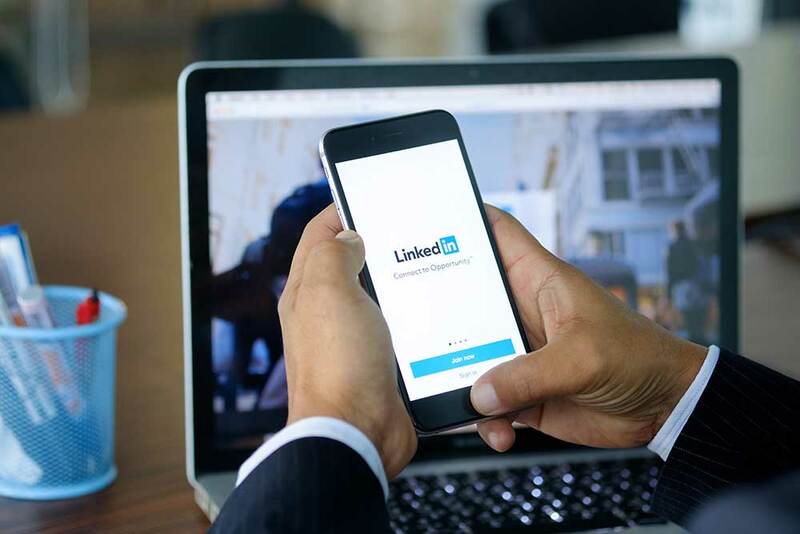 That means, for many businesses, LinkedIn offer opportunities to connect with their target audience where they spend a lot of their time. If you want to take advantage of this opportunity, you will need to create a compelling business profile, create and post engaging updates, and participate in groups. Additionally, if you have the marketing dollars available, advertising can be a great way to grow your followers and leverage LinkedIn as a source for targeted website traffic. Contact MARION’s marketing firm in Houston today for more information on how we can help you improve your business!